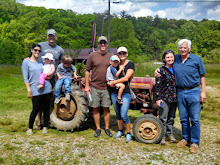 The abundance of rainfall and gently sloped terrain of the North Georgia mountains makes a gravity fed rainwater harvesting system a natural solution for irrigating the crops at Ladybug Farms. The USDA grant is part of the 2010 National Resource Conservation System program which assists beginning farmers with crop irrigation. The system will include two, 5000 gallon storage tanks installed at the base of a large barn and chicken house, gutters and downspouts, distribution pipes to the field and a drip system within the 1/2 acre field. Thanks to NRCS Rep, Doug Towery, for all his support with this grant. Now, anyone available to help with the installation? wow, terri, the site looks great! love the photos on the side bar. Wow! Wow! Wow! So cute ~ simple (in a good straightforward way) and striking! Love you!